Psychology grad student Lauren Patterson had no idea that a simple stop at the bank would change her life forever. Caught in a robbery that turned into a three-day hostage event, Lauren bonded with her captors, convincing them to free the rest of the hostages and eventually surrender to police but not everyone escaped unscathed, especially not Lauren. Struggling with the emotional fallout and notoriety of the publicity surrounding both the robbery and her bestselling book about the experience while up against a deadline for her second follow-up book and battling writer's block, Lauren's new publicist, Meg Fletcher convinces her to come to Meg's parents' inn on Dare Island, North Carolina. There, Lauren hopes to escape from those making demands on "Hostage Girl," finally finish her book and return to school to reclaim her life. There's no room in those plans for a relationship with a hot local cop. New Dare Island police chief, Jack Rossi is settling into island life, enjoying the slower pace and not missing the chaos and complications he left behind in Philly. Sure, he misses his close-knit Italian family but when his wife, also on the force, cheated on him with his partner Jack knew there was no way he could stay. Now divorced, he has no interest in a new relationship with a high-profile woman but that doesn't stop every nerve in his body from jumping for joy when he meets the mysterious Lauren. Ignoring the attraction between them doesn't work for either Lauren or Jack as they gradually become better acquainted. Eventually, they give in to the sizzling desire with the understanding that it comes with an expiration date: the end of summer when Lauren's book tour begins followed by her return to school. Sounds good in theory but when hearts become involved, all bets are off. However, both Lauren and Jack have significant baggage, not the least of which is Lauren's continuing struggle with PTSD. And when the past comes calling, the strength of the bond forming between them may not be enough to overcome the obstacles. 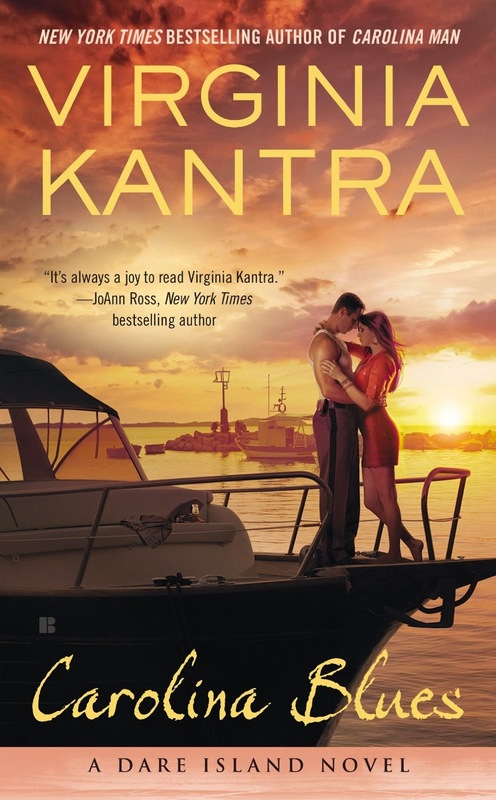 This is the fourth book in Virginia Kantra's Dare Island series and the first time the book has not centered around members of the Fletcher Family. While the Fletchers are still on the periphery, their page time is limited with the central focus on Lauren and Jack as well as well as new characters who, I presume, will play more significant roles in future books. While I missed my time with the Fletchers, their smaller roles in no way diminished the strength of this book. I fell hard for Jack Rossi with his tough guy exterior and soft heart but it's Lauren, and her PTSD struggles, with which I most identified. Kantra doesn't sugar coat the trauma suffered by our heroine nor its lingering effects. I don't know what kind of research she did to develop this facet of the character but she was spot on in her depiction: the panic attacks, flashbacks, guilt, being startled by loud noises, inability to enter a bank, empathy for the perpetrators. I know these symptoms well. It's been thirty-nine years since I suffered them but there were times in this book when I was transported right back there to 1976; when I started to sweat, my heart raced and I not only understood, but experienced exactly what Lauren was feeling. That, dear readers, is superb writing. I also enjoy the pace of the Dare Island books. Like the island on which they are set, the stories flow gently, like waves lapping at the shore, neither rushed nor stagnant but just right. The characters are true to their surroundings as well as the experiences that have shaped them. There are disruptive forces that keep things exciting and move the plot along but, in the end, it's the characters, their growth and their journey, that make these books so special. If you have not yet visited Virginia Kantra's Dare Island, I enthusiastically encourage you to do so. It's fine to start with Carolina Blues. It stands on its own perfectly well or start at the beginning and learn why many readers, myself included, have fallen in love with these wonderful characters and the island they call home. Readers, are you reading the Dare Island series? Do you have a favorite book or characters from this series? What's your favorite beach? If you don't go to the beach, where's your favorite getaway to relax and renew? I have Carolina Girl and Carolina Home on my tbr. Would love to win the 2 that you highlighted (and am from the U.S.) so I don't have a favorite book from this series. Rarely go to the beach any longer. Favorite place to renew is to go to visit our son out west and our friends in Fla.
Patoct, the American West is a beautiful place to rest and renew! Good luck in the drawing. Hope you enjoy Dare Island! Love the review, PJ! I'm a long-time Kantra fan. I fell in love with this series with the first book, and each book that followed has deepened my affection for the characters and setting. I preordered Carolina Blues and read it Tuesday, and I am already eagerly anticipating Jane and Gabe's story. I would be hard pressed to choose a favorite because all four books are keepers. I like reading beach books and viewing the photographs beach-goers share, but in RL when I have the opportunity to get away, I head for the mountains. I have not not read this series yet. I enjoyed her Sweet Home Carolina books - The Return of Conn MacNeil, etc. Would love to try these books. Sounds like a great series. Used to love Jones Beach and Zach's Bay, but am older and no longer like to go. Oh, do give them a try, Helen. If you enjoyed Kantra's Sweet Home Carolina books, you'll probably love these too! I've read and enjoyed Carolina Home but as usual am behind in my reading! I don get to a beach very often but have enjoyed Cocoa Beach in Florida more than once! One of my brothers lives about a half hour from Cocoa Beach. I like that area of Florida! The beaches in Hawaii; went on our honeymoon. Never read any of Virginia's books; sounds like ones I will give a try. I visited Hawaii for the first time last year. Gorgeous beaches! Have not read the series yet. I highly recommend it, jcp! I just started these books and love them! Can't wait to dig into the next one. You have lots of wonderful reading ahead, Debbie! I have her Children Of The Sea series and really need to start the Dare Island series. I enjoy her writing. She is a wonderfully descriptive author and says much in a few words. I love this author! I didn't realize she was coming out with a new book will have to order it soon. I haven't read this series which sounds captivating and special. I love the beach although I don't live near one, but vacations are spent at the beach which are soothing, calming and healing. I love beaches, the ocean and sunshine. Walking along the shore, reading on the sand and relaxing. My favorite beach is New Smyrna Beach, Fla. Gorgeous, large and perfect for walking, running and reading. What a wonderful post which has introduced me to a great author and books that I could lose myself within the pages. Many thanks. Beaches are and always have been my getaway to relax and forget about life, and problems. When I was weak and frail recovering from breast cancer I made a promise that the first holiday when I felt stronger would be a beach one. Beaches restore my health, outlook and give me hope. The Jersey Shore is one place which was special and reminded me of the 1950's. Going to the beach is the ultimate. I really enjoyed Carolina Blues and every book in the series. Luke is my favorite hero so far and I wish I could be adopted by the Fletcher family. The book's setting, the Outer Banks, is our beach go-to place. I have not read any of this author's books. This series sounds like something I would enjoy. Forgot question - love to go to Florida - Disney park to relax and enjoy. These series sound good. Will have to get me some. Sorry I already posted a few days ago.